February 6, 2006 | With Brokeback Mountain earning eight Oscar nominations, the film has lassoed as much acclaim as it has controversy. But the decision to bring the film about a secret love between two gay cowboys to Cache Valley was simple for Westates Vice President T.J. Rudman. It all comes down to numbers. "It's a controversial subject matter, but there's a demand too see it and people are mature enough to decide what movies they watch," he said. "I don't agree with chopping off heads with a saw or cutting off fingers with bolt cutters, but we played Saw 2 and Hostel. "If there's a market, and if we have a screen available and can get a print, we'll show it. . . . Brokeback is not going to set any records in Logan, but if people want to see it, we're going to do what we can to get it to them." The film first made its way into the Providence Stadium 8 theater a few weeks after it hit Salt Lake City. Rudman said this is simply because the film's distributor, Focus Films, had not made enough prints of the movie available for a smaller market such as Cache Valley. hangs outside a theater in Providence. Rudman said many films distributed by small companies, such as Focus, are hard to get. But he said he tries to secure as many prints as he can for Cache Valley. "It's one of the misconceptions that we have a list of films we're going to show," he said. "But distributors decide how many prints they're going to make and where it's going to play." 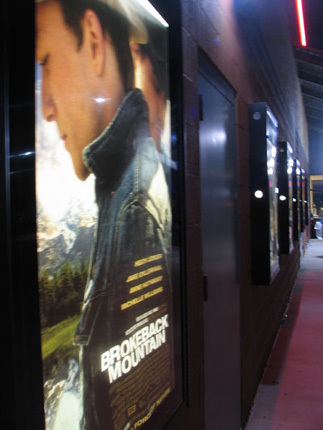 Rudman said Focus recently released and additional 500 to 600 prints of Brokeback Mountain, which allowed Westates to show the film. He said he has also been trying to get prints of Capote and The Squid and the Whale. "I think we've done quite well in Logan, getting a whole bunch of films that were not very widely released," he said. "We've played Fahrenheit 9-11, Supersize Me, Passion of the Christ, New York Doll, every limited-release film that I could get." While Rudman said many of these limited-release films are the most critically acclaimed, and even top his favorites list, they are not big money makers for his business. "For the most part, they don't do very well," he said. "I can't put Brokeback Mountain on four screens, because at the end of the day, I have to ask how Harry Potter grosses against Brokeback Mountain. Rudman said he has received some complaints about the film and even more thanks for bringing it to Logan and St. George. "I got a thank-you note from someone in Providence who said it was heroic and courageous," Rudman said. "There's nothing heroic or courageous about it. All we do is show a movie."